Designed by Ewart Crellin, 1887-1950 (as also the Lezayre War Memorial), carving by Harry Hems & Co (who also did St Matthews War Memorial). THE PROPOSED WAR MEMORIAL AT DOUGLAS. The public of Douglas have not much to compliment themselves over in relation to the proper commemoration of the deliverance wrought for them and theirs by the gallant dead, but at last a memorial scheme has been decided upon, and subscriptions are being solicited towards the erection of a monument after the exceedingly handsome and appropriate design reproduced above. 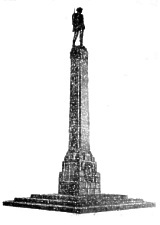 This design, which is the work of Mr Ewart Crellin, architect, Douglas, consists of a stone base rising in four steps, and upon this a tall column of Manx granite, surmounted by the figure of a soldier. The height of the whole structure will be fifty feet. On one side of the base will be graven a wreath of victory; on another side, a short inscription; and on the other two sides will appear the names of the men from Douglas who fell in the war. The entire monument will be surrounded by a flower garden, handsomely railed, and is estimated to cost about £3,000. The site allocated is that formerly occupied by the bandstand, on the seaward side of the Harris. Promenade.